Hi guys, Jacqueline here. 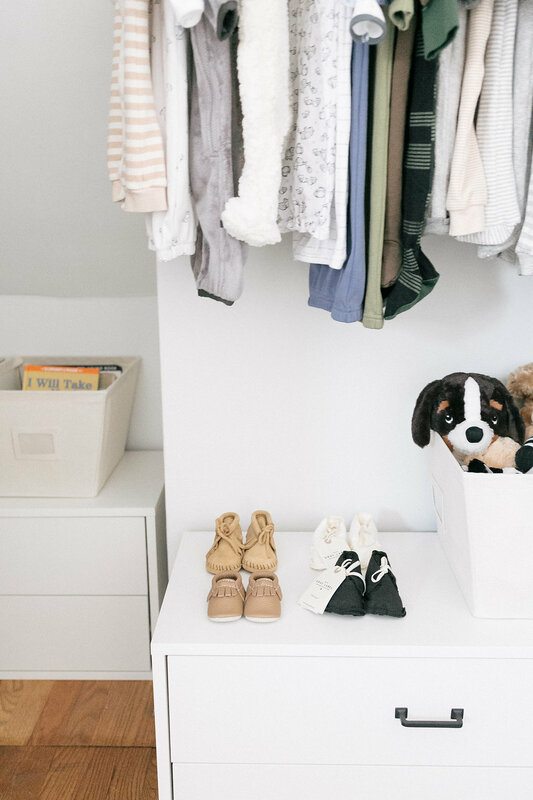 It’s been a long time coming, but Baby Brown is here and I am so excited to finally share his nursery reveal with all of you! We welcomed Luca Emerson Brown into our little family on Sunday, November 19th – exactly one day before his due date and he was even kind enough to make sure we weren’t in the hospital over Thanksgiving (already loving his timeliness). 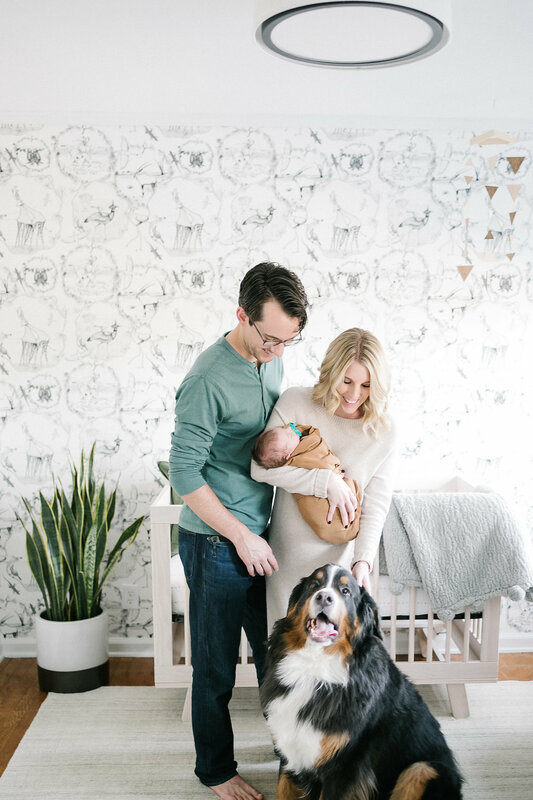 As I am sure those of you with little ones can imagine, life has been nothing short of crazy over here as we pick up our pieces daily and desperately try to maintain some sense of normalcy while establishing our new routine as a family of 4 (Piper included). I am slowly learning to let go of the chaos and exhaustion that comes along with having a newborn and embrace the moments we have with him while he’s this little – everyone says they grow up so fast and even after only six weeks I can already attest to that. 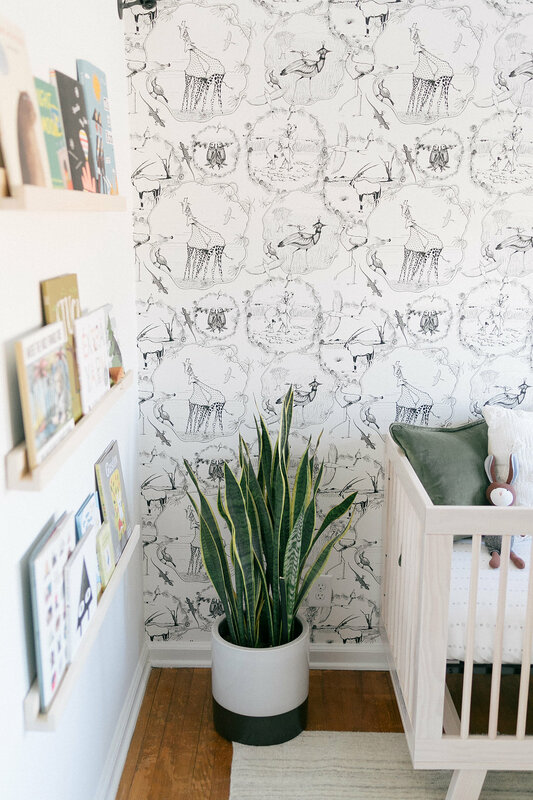 Now onto the nursery – this space was my labor of love for 2017. 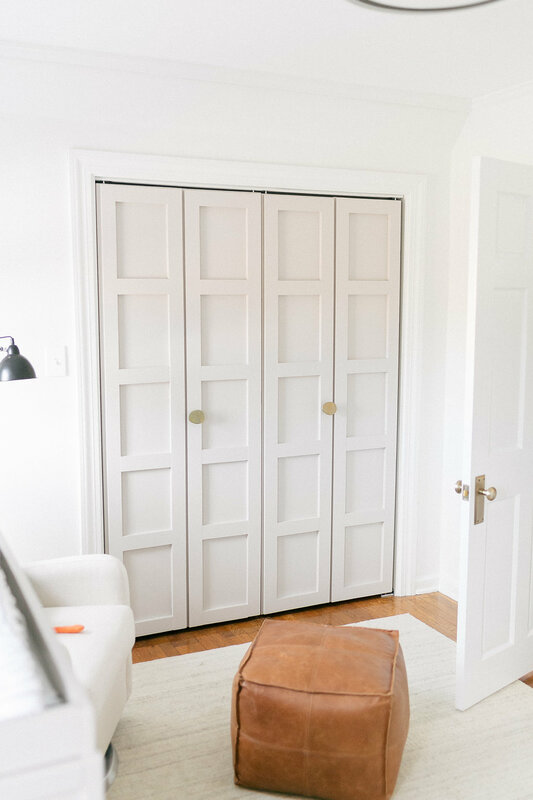 Click through to see the finished room I designed for little Luca! 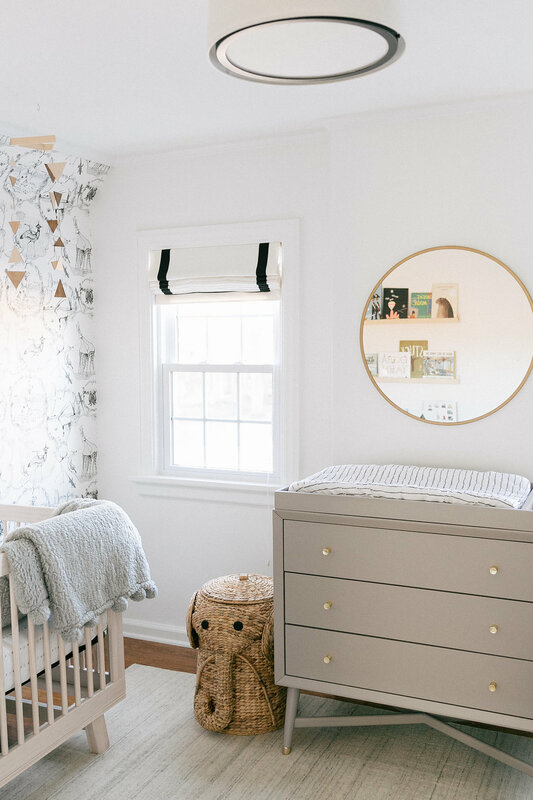 Nurseries are by far my favorite room to design; I studied early childhood environments in college as a part of my senior capstone and ever since then I have loved creating special spaces for little ones. 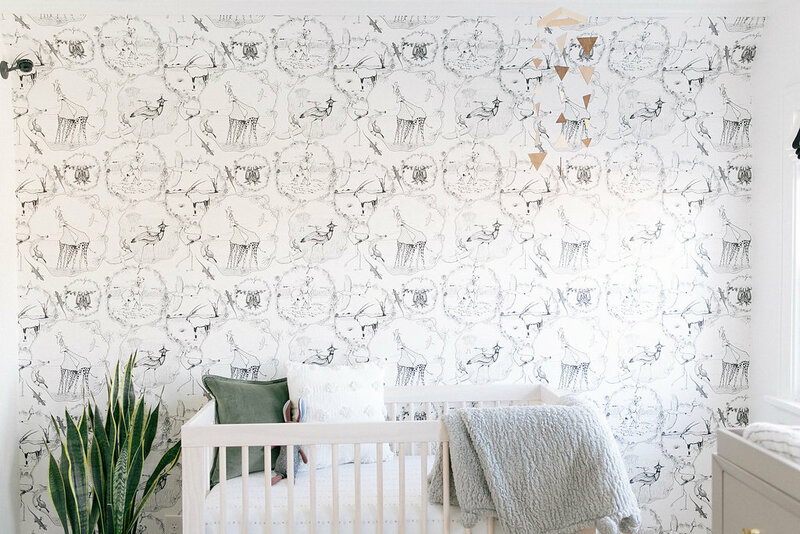 If you remember way back to July, you guys helped me narrow down ideas for our nursery. We went with Nursery Design 1, but as you can see it changed quite a bit from the original plan. The wallpaper was my starting point and inspired the rest of the room. For those of you who are hoping to install wallpaper for the first time, here is a guide we shared from the project. One of the biggest changes we made to the original design was choosing a neutral, wool rug over a vintage one. Although the room already had lots of neutrals in it, we felt that the pattern in the wallpaper and rug would be too much. 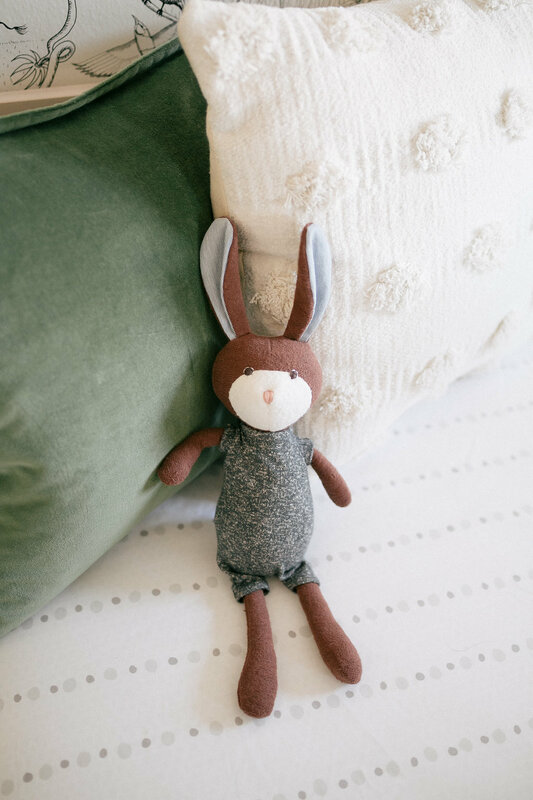 We also wanted to make sure we picked something soft that was made of natural materials since the baby would be spending lots of time laying on the floor and crawling around on it. We landed on this rug from Rejuvenation and could not be happier! One of the projects Dan worked on for the nursery were these DIY book ledges. We followed this easy tutorial from A Beautiful Mess. I chose to keep the wood natural rather than painting it, so that it would compliment the crib. 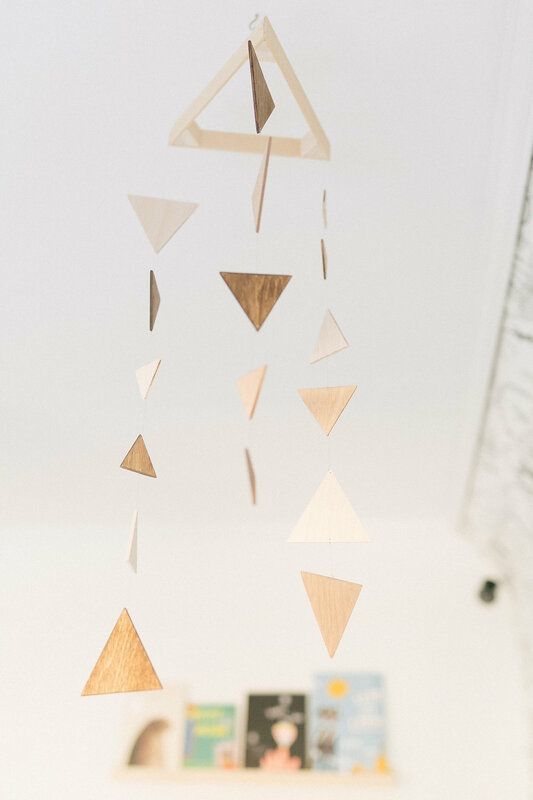 I seriously think he worked on these for a few hours one afternoon and then they were up…one of the easiest DIYs we’ve ever done! I’ve had fun filling them up with some of my favorite childhood books, as well as a few from my wish list. The other big project Dan worked on was bi-fold closet doors, which we may or may not have copied from Sarah and Emmett’s Ohio home. If you missed that DIY post be sure to check it out here (it’s a good one). These doors turned out to be the bane of our existence after we ran into one issue after another. Long story short, we finished the doors and quickly found out once we put them on that they would not open. Even though we measured multiple times, we forgot to take into account the new depth of the doors once the trim work was added- which is what caused the doors to not open (rookie move, I know). Dan had to trim the doors down, re-sand and re-paint them. Now they are good as new, but let’s just say we have learned from our mistakes with our first home. 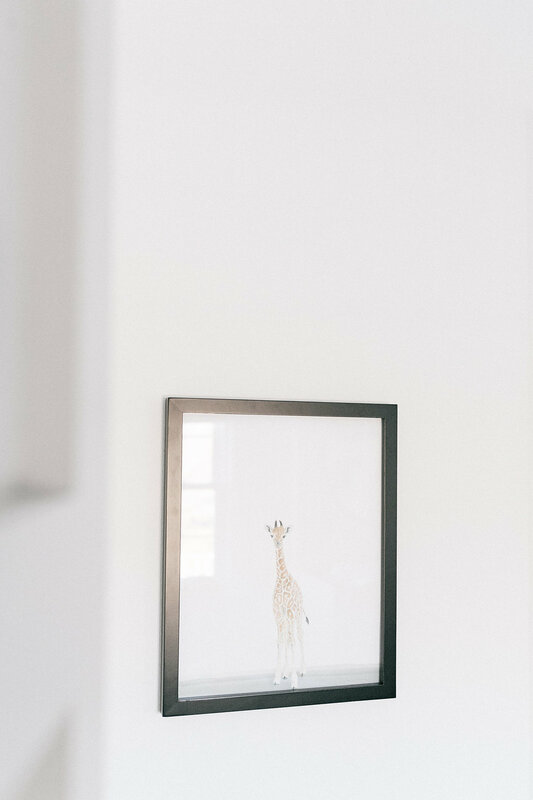 This adorable giraffe print was hand drawn and painted by the talented Laurie Anne of Laurie Anne Art. She gifted this piece to us for our nursery and I love how it plays into the whimsical animal wallpaper. 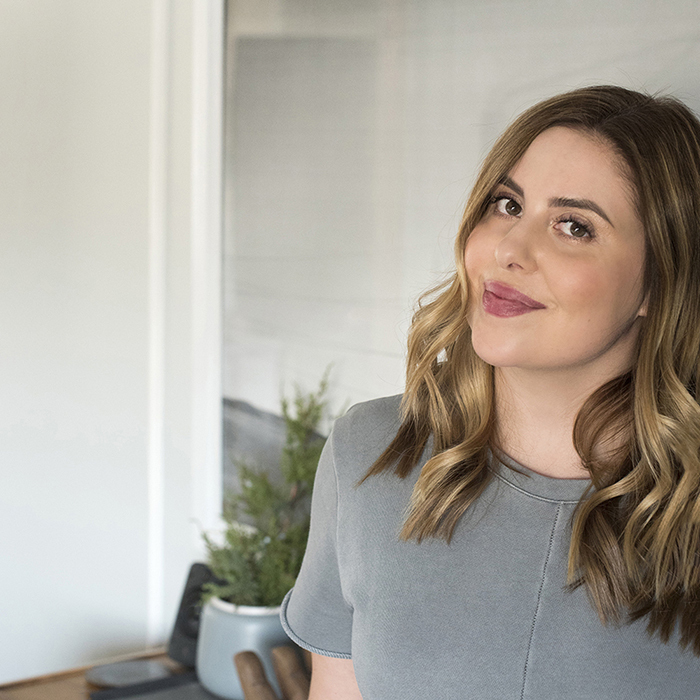 She also has some nudes in her shop that I love and I have my eye on (you may have already seen a few of them in Sarah’s bathroom she completed for the One Room Challenge). I love the way the crib looks against the wallpaper. 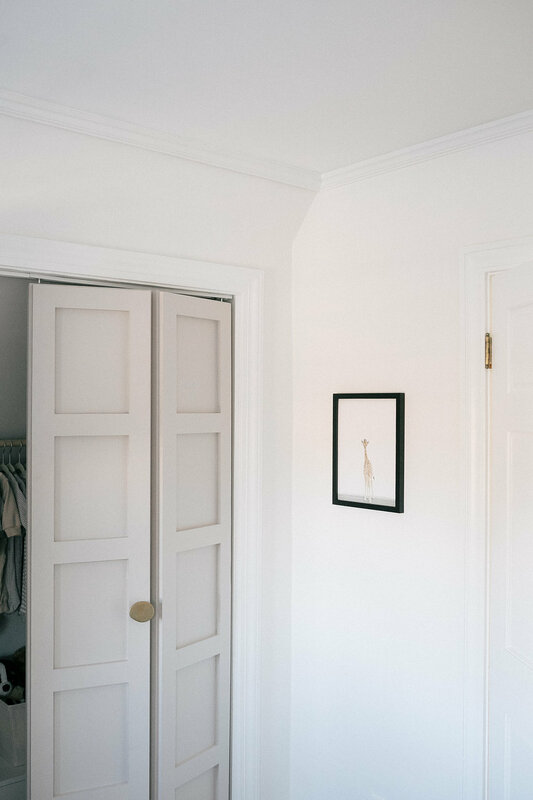 It’s a nice, calming vignette that feels fun- yet not overwhelming. I also wanted to add plenty of textiles to the space. I mixed velvet, wool, and cotton to create a layered look within the bedding. Initially, I thought I’d attempt a DIY mobile, but later decided I didn’t have time to squeeze it in. I’m glad I didn’t because this one is darling and really affordable. A few weeks after Luca was born we had a friend of ours come over and shoot his newborn photos in our home. I’d love to tell you he was perfectly behaved and slept the entire time. However, that was NOT the case. He cried through half of it, then filled up his diaper right in the middle of the shoot. Ha! I’d say we gave this young married couple a clear picture of what life with kids looks like…they may never have children (kidding). 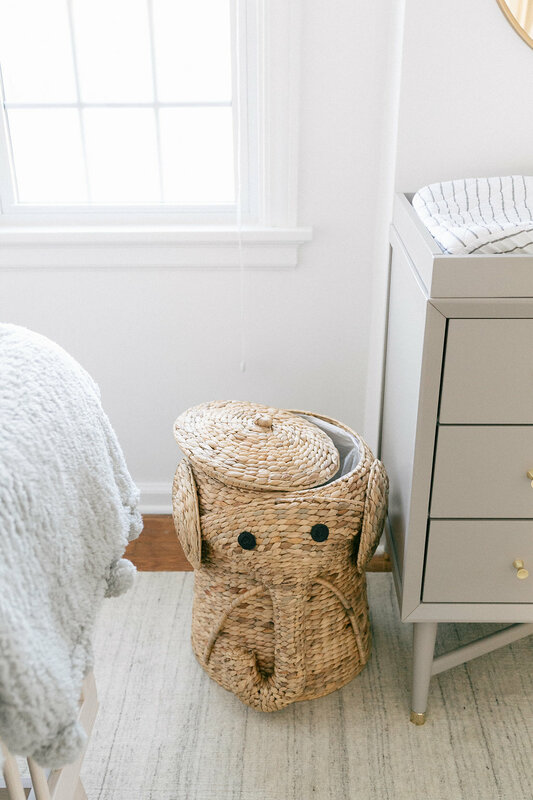 This elephant hamper might be one of my favorite details in the room. Again, it ties in perfectly with the loose animal theme and I love the woven texture it adds to the space. I’d also be doing you a disservice if I didn’t mention the glider we picked out. 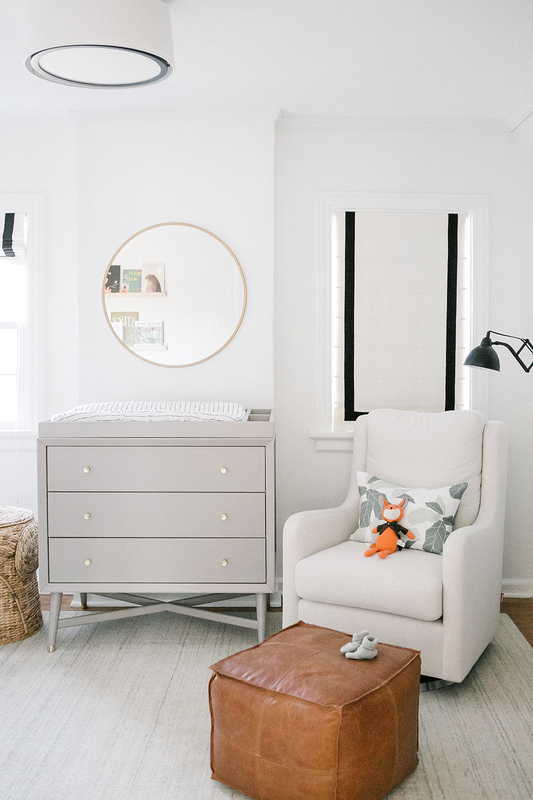 It was definitely our splurge for the room, but I think if there is one piece you are going to splurge on for a nursery- it’s the rocker/glider. We were a little hesitant to buy something online without having the chance to sit in it first, but I read SO many great reviews on it and everyone said it was well worth the price. After a few months of using it, I’d have to say I agree. It is by far the most comfortable piece of furniture we own…good thing I have been spending lots of time in it! It will surely be a piece we use over and over again. Another big change in this room is the door. It finally has a real door! If you remember before, this room was our guest bedroom and it had awful slotted doors that looked like they belonged on a pantry. I don’t know what the previous owners were thinking! Now we have a real solid wood door (a must with a newborn) and beautiful new brass hardware courtesy of Nostalgic Warehouse. 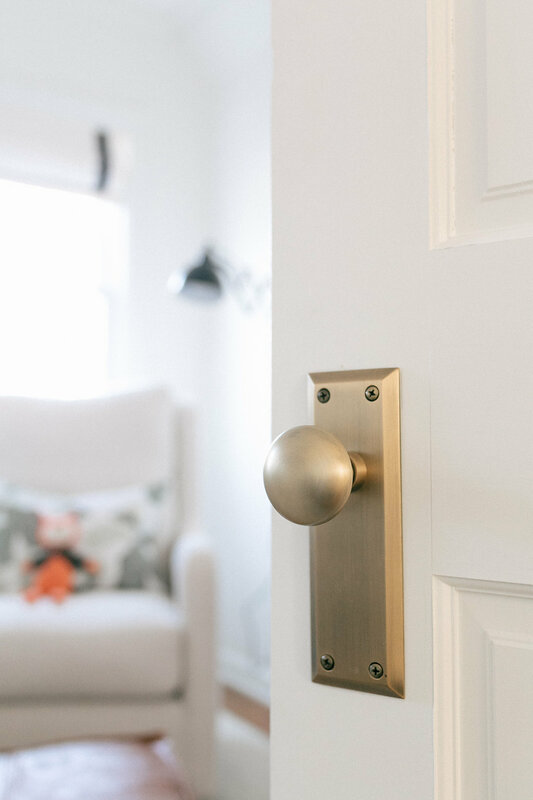 We used their New York plate with knob and door hinge in antique brass to match the rest of the original hardware in the upstairs of our home. The little details really make a space! 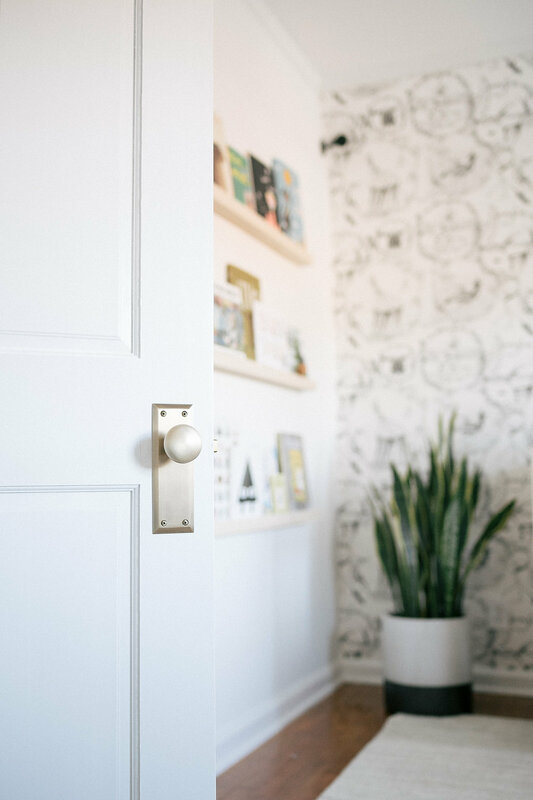 For more on selecting door hardware, check out this post. It feels good to have another room in our home completed. Right now, Luca is still sleeping in our bedroom which means we are only using his nursery for feeding and changing but it has quickly become one of my favorite rooms. I am already eager to get started on another one – which room should it be? 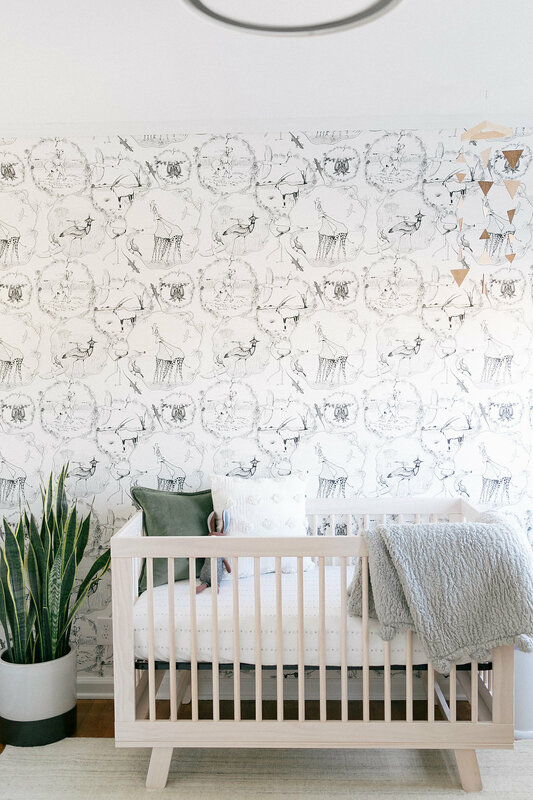 See the final design board and get the look for Luca’s nursery below! Jacqueline, this nursery is amazing!! I absolutely love how it’s so clean and bright while still feeling warm and comfortable. Little Luca is very lucky! Congratulations! Thank you, Julie! I am glad you loved it so much. We definitely do…and hope Luca does too as he grows up! Lovely! Where is the crib sheet from? It’s adorable! I love the dresser but when I went to the link it only said the color was French gray. Is that what color you have? And did you guys by the matching topper that holds the changing pad or did you build it? Yes, they have the French gray, Teresa… and Jackie also bought the matching top. Hope this helps! Hello! Where is your light green throw from? Thanks! Hey Jacqueline! I’m decorating my nursery now and love love your window coverings – where did you find them? Thanks! Thank you! What fabric/colors did you choose? Such a beautiful nursery. My husband and I are using it as inspiration for ours! Where did you buy the bookshelves? Thanks! Hi Jacqueline, you did a great job on this website. Everything is beautiful and easy on the eyes. I’m trying to figure out the color of the crib? It is difficult to tell from photo to photo. Where did you get the drawer organizers? I looked at the other blog you linked and she didn’t link them either. Such a beautiful space you created. Hi! Love this wall paper its perfect! where is it from?! Hi Hannah! Thank you. :-) The wallpaper was from Anthropologie. It should be linked in the post – not sure if they still carry it or not. Hope that helps!